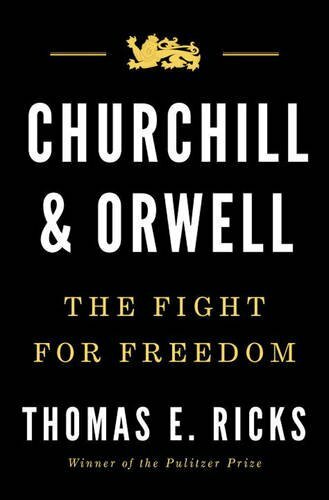 From Pulitzer Prize–winning historian Ricks, a dual biography of Winston Churchill and George Orwell, who preserved democracy from the threats of authoritarianism, from the left and right alike. Ricks wisely skims lightly over the early years of his subjects and, with Churchill, his ineffectual later years, as well, focusing instead on the 'fulcrum point,' the 1930s and 1940s, when both men were frequently lonely voices in the wilderness ... Churchill & Orwell is an eminently readable, frankly inspirational and exceptionally timely tribute to the two men Simon Schama called 'the architects of their time.' It is to be hoped that their counterparts in intellectual clarity and moral courage are among us today. ...[a] page turner written with great brio ... For Ricks, the relationship is essentially about freethinking. He doesn’t always force connections or contradictions for readers; for example, the link between Winston Smith’s job rewriting history, much as the former prime minister was doing in his own memoirs, goes undeveloped. But what comes across strongly in this highly enjoyable book is the fierce commitment of both Orwell and Churchill to critical thought. [Ricks] compares the two, highlighting not just their skills and strengths, but the tumultuous times that demanded the highest exercise of their talents ... Ricks doesn’t try to make connections where none exist — the men lived parallel but separate lives. However, the last article Orwell published before his death in 1950 was a review of the second volume of Churchill’s war memoirs. His main character in 1984, a man whose abiding desire was to live free, was named Winston ... Readers of this book will realize, if they needed reminding, that the struggle to preserve and tell the truth is a very long game. What did you think of Churchill & Orwell: The Fight for Freedom?